One representative from winning individual/team will receive an all-expenses paid trip to Supercomputing 2016. Members of the winning team (up to 5 people) win an Apple Watch Sport. Apple iPad Air 16GB for members of the winning team (max of 5 per winning team). Finalists are announced! Read more on the OpenPOWER Foundation blog and stay tuned for Grand Prize and rankings announcement during the OpenPOWER Foundation Summit in Barcelona, Oct 26-28th. We just launched the Linux on Power Developer Portal – your entry point to a community and resources for developing, migrating and testing your applications on IBM Power hardware in the cloud. Read more and check it out here. Have a need for speed? Performance barriers getting in the way? We know traditional system architectures aren't keeping up with the performance demands of your data-intensive applications. A faster platform coupling a powerful processor with hardware acceleration technology is out there – but we know that change isn't always easy. So we're handing you the keys to a totally different car - built for speed and performance on a brand new road. Take it for a test drive and see how fast you can go! Create a new Spark application that uses GPU acceleration, or add GPU acceleration to an existing Spark application. What will you build? How fast will you go? Get your hands on OpenPOWER! Check out the SuperVessel development environment you'll be accessing. Why come to the OpenPOWER Ecosystem? Access a wide range of familiar development tools and a differentiated set of accelerators that will help you unleash innovation that you never thought possible. Participate in an ecosystem that truly exemplifies “open”—across not only operating systems, and software, but also hardware. Showcase your talents across the breadth of the OpenPOWER ecosystem— to the companies, communities, and users who practice the best of machine learning, HPC, and Big Data. Develop critical skills in the increasingly important area of accelerated computing that can set you apart in the future. Compete to win a trip to SC 2016 in Salt Lake City, UT in November. This challenge is open to individuals who are at least 18 years of age as of the time of entry, teams of eligible individuals, and organizations with no more than 50 employees from the following countries: Australia, Canada (excluding Quebec), China (including Hong Kong), France, Germany, India, Israel, Japan, Mexico, Netherlands, South Korea, United Kingdom, and the United States. See the Official Rules for complete eligibility requirements. 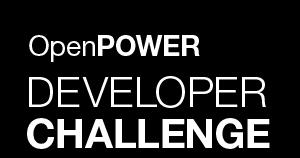 Which OpenPOWER Developer Challenge track will YOU take? Review our Resources page for full getting started tips and tutorials. Does your contribution add ppc64le support to an existing application or package? How widely used is your solution within the free / open-source community? If your solution is open-source, was it successfully contributed back to the original project? If your solution is not open source, what's your path for distribution on OpenPOWER? How will you provide and support a binary? How well does your solution leverage the technologies available in the OpenPOWER ecosystem, like 8-way multithreading on POWER8, or accelerator offload via accelerators? Does the solution incorporate Spark as the framework to scale beyond a single node? How well does the solution incorporate Spark to scale? The extent to which the submitter demonstrates in a verifiable manner, performance gain after GPU-enabling your application (2-node Spark non-GPU enabled versus 2-node Spark GPU enabled). Does the solution: Incorporate any innovative ideas for the Spark Community? Incorporate multiple possibilities across “A”, “B”, and/or “C” of the Spark Rally? Address Deep Learning challenges as defined in the “Cognitive Cup”? End-to-end accuracy achieved for the problem. How well is Deep Learning exploited as part of the solution? Does the solution incorporate any new approaches to the Deep Learning problem (e.g. did the submission involve creating new code, algorithms, or leverage emerging frameworks)?